The holidays can be a very difficult time for families to stay on track with some of their usual routines and schedules. Life happens, and let’s face it, with all the hustle and bustle this time of year, many of us aren’t getting enough sleep. I’m sure everyone will agree that things are much easier and much more fun when our children have had enough sleep. No one wants to bring a cranky child to their special holiday dinner that they have been looking forward to for months! 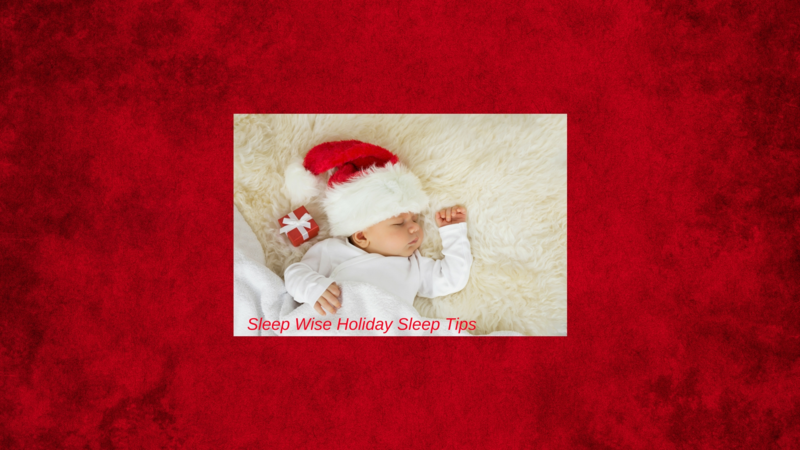 I have put together some tips that will help your family enjoy the holidays without having to lose sleep over it. Plan Ahead: Have a schedule planned out so you have enough time to get things done and you aren’t running errands into your child’s naptime or bedtime. Hire a babysitter: If you know the party is going to go later than your child’s bedtime you are better off to leave him at home. I often wait until my children are in bed to go out so they don’t even have to know I have left. I have a much better time when I know my children are safe at home in bed. If you choose to bring them, be prepared to cut the night short. If they are going to bed much past their bedtime there is a good chance your child will take much longer to go to sleep than usual and this will also affect the next 24 hours of sleep. Don’t forget…sleep begets sleep! If you are celebrating at your house you can consider a white noise machine for your child’s bedroom to help drown out any music or loud voices. All of the special holiday T.V. shows are on right now and it is tempting to let our little ones watch them right before bed. Television prevents the release of melatonin which is the hormone that helps us go to sleep. This will make it much more difficult for your child to fall asleep in the usual 5-20 minutes and could cause them to catch a second wind – again making it more difficult to go to sleep. Try to avoid any television or video games for at least an hour before going to bed. Try to avoid letting your children over-indulge on sweets. Especially chocolate. Chocolate contains caffeine which will stimulate your child and make it difficult to go to sleep. Sugar is also stimulating, not to mention the potential tummy ache later in the evening. You definitely want to avoid caffeine after 2 pm and sugar after dinner. Don’t skip naps. This will lead to your child being very over tired at bedtime and make it difficult for them to go to sleep, and often, to stay asleep. If your child needs to have a car nap for one day it is better than no nap at all. If you are staying overnight with your child, make sure you bring a pack and play or rent a crib. Most hotels have them available so be sure to ask for one when you make a reservation. It is important that your child’s sleep space remains consistent. If your child is eight months or older, you may want to create a space for them to sleep where they can’t see you. If they can have their own room that is ideal but I’m sure most of us would be sharing a room. Use a blanket or screen of some sort so that if your child wakes in the night they aren’t going to see you and think it’s time to get up. If there is a chance that the room you will be staying in won’t be dark, make sure you have something available to keep out the light. The GroCompany makes a window cover that is great for travelling and wraps right around any window. This will be helpful for morning wake ups as well as naptime. Try to keep yourself on track with your own sleep. With all the festivities and parties it can be difficult to tear yourself away to go to bed but remember, there is someone who will be looking to play first thing in the morning! I hope these tips will help you enjoy your holidays to the fullest. You don’t want to be paying back 2016’s sleep debt in 2017! Have a safe and happy holiday season and I wish you all the best in the new year!